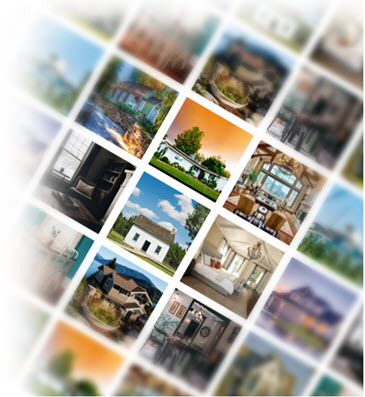 View all available Flower Mound real estate listings and homes for sale in Denton County. Unlock detailed reports on Flower Mound homes for sale including property price and status changes, community statistics, neighborhood information, nearby Flower Mound ISD school district and amenities, virtual tours, 360 virtual reality photo tours, drive time search and more. If you're considering buying, selling or renting Flower Mound, TX real estate, you've come to the right place! Our Realtors can assist with all your Flower Mound real estate needs and help you find all available housing options in Flower Mound including homes, new homes, townhomes, condos, high-rises, lofts and apartments. Flower Mound, Texas is a vibrant community offering easy access to Grapevine Lake, Lake Dallas, DFW Airport and a short commute to Downtown Dallas and Fort Worth. Flower Mound offers everything from traditional single family homes in the suburbs to new modern waterfront high-rise condos on Lake Grapevine at Lakeside Tower in Lakeside DFW, a master planned urban waterfront community in Flower Mound on Lake Grapevine that offers high-rise condominiums, waterfront homes, apartments and bungalows. Buy and sell a home in Flower Mound with DFW Urban Realty and receive a discount on our listing services. Sell your home in Flower Mound and save thousands in Realtor commissions! Our listing services will help you sell your Flower Mound home on your timeline for maximum profit by generating maximum buyer traffic through our DFW website and our online real estate marketing and social networking channels. Contact us today at (214) 764-4124 and ask about special incentives, discounts and rebates on homes in Flower Mound you may qualify for whether you're looking to buy a home for sale in Flower Mound, sell your Flower Mound condo or townhome, or rent a Flower Mound apartment. RECEIVE FLOWER MOUND HOMES FOR SALE WITH LISTING PRICE/STATUS CHANGE ALERTS, 1st DAY ON MARKET! 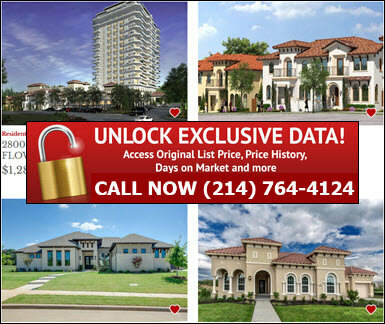 UNLOCK EXCLUSIVE FLOWER MOUND MLS HOME LISTING DETAILS! When it comes to convenience, our Flower Mound real estate search is unparalleled. Whether you're in the comfort of your home, or on the go, our site works flawlessly on multiple devices so you can search Flower Mound homes for sale with ease. Receive listing updates on Flower Mound home listings that match your search criteria, the 1st day on market! UNLOCK Cumulative Days On Market, HOA Home & Condo Association Dues, Property Listing Price & Status Change Dates and more! By combining modern technology with local expertise, our Flower Mound Realtors are able to deliver an unmatched level of customer service! Search Flower Mound homes for sale including pre owned, new construction, bank foreclosures, wholesale properties, auction and short sale listings. 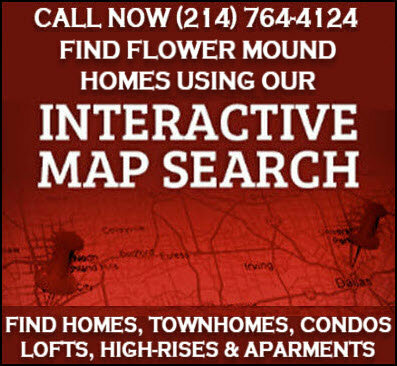 We offer multiple options to real estate in Flower Mound, Texas including search by listing number, address, city, county, zip code, school district, subdivision, polygonal map, radius map and drive time search. In addition to homes for sale in Flower Mound listed on our site, we can also help you find Flower Mound homes not listed in the MLS including pocket listings, coming soon homes and new homes for sale in Flower Mound, Texas. Our new home search can help you find Flower Mound new homes for sale by location, home type, floor plans, promotions, new home community, builder name and amenities including golf course, waterfront, senior communities. We work with all Flower Mound builders and can help you find new homes for sale in Flower Mound offering the best builder discounts and incentives available! We've helped home buyers take advantage of pre-construction pricing on coming soon new home communities in Flower Mound, find grand opening and special promotion events with discounted price points and free upgrades on Flower Mound new custom homes and cash in on huge price breaks and savings on Flower Mound new construction builder closeout inventory. Flower Mound, TX was once only viewed as a large master planned community in the form of a town but all has changed since Flower Mound embraced New Urbanism and incorporated several new mixed use urban residential and commercial developments into the master economic development plan and vision for Flower Mound's future. Real Estate in Flower Mound has boomed in the past couple of years with dozens of new residential, retail and office projects spread throughout the town's 43 sq. miles. Below are the major current and planned economic development projects in Flower Mound including new mixed use urban live, work play districts and villages. Lakeside DFW on Grapevine lake in Flower Mound is a master planned mixed use urban lakeside community offering a live, work and play lifestyle. Lakeside DFW includes both residential and commercial developments offering residents multiple housing options in a walkable community with access to retail shops, restaurants, and other lakeside amenities. Lakeside DFW's main housing attraction is a sixteen story waterfront high-rise condo at Lakeside Tower. Other Grapevine Lake waterfront homes in Flower Mound include Lakeside DFW estate homes, villas, townhomes, apartments, lofts and senior rentals. Lakeside Business District in Flower Mound is a campus commercial district located on 1,500 acres just three miles from DFW Airport. There are a total of ten business centers within its boundaries including Cornerstone, Corporate Ridge, Flower Mound Business Park, Lakeside Commerce Center, Lakeside DFW, Lakeside International, Lakeside Ranch Business Park, Lakeside Trade Center, Parkview Commerce Center and Southgate. The lakeside business district has attracted more than 45 businesses including Best Buy Distribution, Stryker Communications, HD Supply, Mohawk, ThermoTek, Signature Systems Group, Whitlock and Home Depot. Canyon Falls in the Towns of Flower Mound, Northlake and Argyle is a 1,242 acre master planned community located in the Denton Creek District in Northwest ISD and Argyle ISD. Canyon Falls urban village, located on rolling terrain, a creekside canyon and high bluffs, offers a mixed use live, work and play commuity with urban homes and amenities including Canyon Falls Club, Westbridge Park, The Hay Barn and Pooch Park. Besides an endless amount of outdoor activities, Canyon Falls offers an array of local restaurants, shops, and attractions. Urban Shopping centers include Shops at Highland Village, Shops at Lakeside, Southlake Town Square and Historic Grapevine. Residents also have easy access to DFW Airport, Texas Motor Speedway, University of North Texas, Texas Woman's University and Fort Worth Stock Yards. Denton Creek District in Flower Mound is a master planned mixed use urban district that spreads over the Towns of Argyle, Northlake and Flower Mound with 626 acres within Flower Mound real estate boundaries. Denton Creek District is apart of Flower Mound's long term economic growth plan that includes mixed use master urban planned communities where residential uses could include single family detached houses on quarter lots, zero lot line housing subdivisions in Flower Mound, duplexes, townhomes and commercial apartment communities. The River Walk at Central Park in Flower Mound is a located on 158 acres North of FM 1171, East of FM 2499 and West of Morriss Road. River Walk offers residents the perfect urban village setting to live, work and play with mixed use buildings with retail shops on ground level and apartments, condos or townhomes in Flower Mound located above. River Walk homes in Flower Mound currently include townhomes priced in the $300-400's with two and three bedroom floor plans. The River Walk at Central Park townhomes in Flower Mound offer residents an amphitheater, restaurant row, a scenic river, retail shops and offices in a live, work, play scenic urban setting. Flower Mound, TX is a master planned town located primarily in Denton County with parts in Tarrant on Grapevine Lake with over 76,000 residents that are served by Lewisville ISD. Flower Mound is known for the "mound" located in the center of town covering 12.5 acres. Flower Mound's urban development and mixed use projects and communities include Lakeside DFW with Lakeside Tower High-Rises, Lakeside Business District, Denton Creek District, The River Walk at Central Park and Canyon Falls.